Sometimes I just want to do nothing. Or for the language purists among you : sometimes I just don’t want to do anything. Whichever you like best. Those moments I don’t want to run to another cool art festival or to one of the many museums in London I haven’t seen yet. Sometimes I just want to sit somewhere, enjoy the weather, think a bit about Life, The Universe and Everything, or wonder about how on earth I ended up having a pirate living with me. Well I guess you know those moments yourself. Maybe not exactly having a pirate living with you, but the rest. There are several places in London absolutely perfect for doing nothing. The Southbank is one of my favorites places to sit and do nothing. Trafalgar Square sometimes is, when it is not too busy. And last Sunday I sat down on the stairs of St. Pauls Cathedral, and I did nothing for hours. It was excellent. I did not really do nothing at all of course. I bought orange juice and an apple jack in Marks & Spencer, and indulged that. I ended on a lot of photographs, because it is such a popular place to take pictures of. I listened to an explosion of churchbells for half an hour (really) trying to find out if there was supposed to be any idea behind them tolling at the same time, which, in my ears, sounded rather messy. But then, I am not a tolling expert. And I watched people coming and going, eating and drinking, reading and writing, talking and being silent, hugging and kissing, and there were in fact several other people there doing absolutely nothing. It was inspiring. In front of me a man was sitting down. He ate his M&S sandwich. And I knew instantly that he was a nice man. Now how did I know that, you wonder. When did I suddenly became an expert in that area. Well don’t worry I did not. 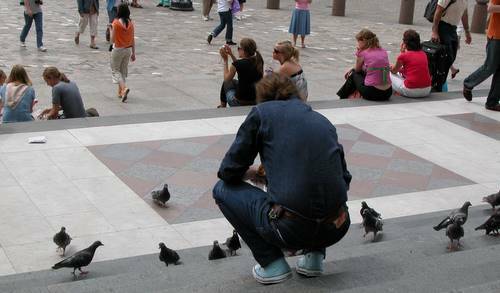 But I knew he was a nice man because he was trying something that I could find myself doing too : to feed the one particular dove that has problems walking, and that has problems getting any food in at all because the other doves show no respect and eat it all right in front of her nose. This nice man is trying to throw some of his M&S sandwich in her direction. First from a distance, but the other doves don’t let him. In the end he goes down the stairs and sits right beside this sad looking dove and feeds her. She finally gets something to eat. See, I told you he was a nice man. And I have no idea who he was, but it’s him on the picture. I like people who are considerate like that. To kill the suspense – No. No, this is not one of my dating posts, and no I didn’t ask for his phonenumber, even though I like his aquamarine Converse All Stars shoes. But I have my hands full on this crazy pirate at the moment. Hm, maybe he could’ve helped you tame that arrrrrr pirate? No need, me and the pirate are getting along fine. New York, New York at last?